Gotta go support my home team, but I thought I'd share this (all-natural, gluten-free) Broncos cake I made for the occasion (below). The above cake was made for a Super Bowl party a couple years ago, when sadly the Broncos were playing Tebow and Super Bowl dreams were just that. For team spirit, I'll post the recipe for the Broncos Cake soon, so you can celebrate the Broncos whenever you want! First, let me apologize for not having posted anything in a few weeks. I've been having a difficult time with the early darkness of winter, as I always do at this time of year. I have been trying to accept the cold, but I need the sun to help me out a little, too. Also, it's difficult to cook a dish and photograph it before I lose natural light. But enough with the excuses. Let's bring some of that brightness we're craving back into the kitchen. During Thanksgiving this year, I learned how to roast a turkey (!). This is a first for me, because I had been a vegetarian for the previous couple of decades. My aunt Lynne usually hosts Thanksgiving and texted me a while back so see if I would eat turkey along with everyone else if she purchased a sustainably-raised one. I gladly accepted this offer and jumped at the chance to actually learn how to cook a turkey. 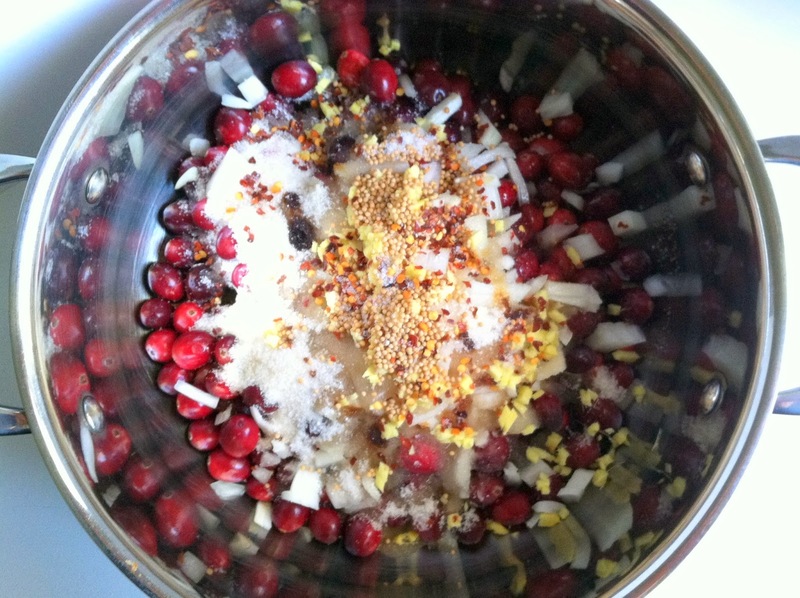 While our family has a set of traditional dishes at Thanksgiving, like the turkey and fixings, mashed potatoes, sweet potatoes, vegetable sides, and my beloved cranberry sauce, the way in which each is prepared changes each year. This is wonderful for us home cooks, because we get to try out new dishes and flavors. Our menu is always current and accommodating (last year I wrote about cooking for a group with various dietary needs). 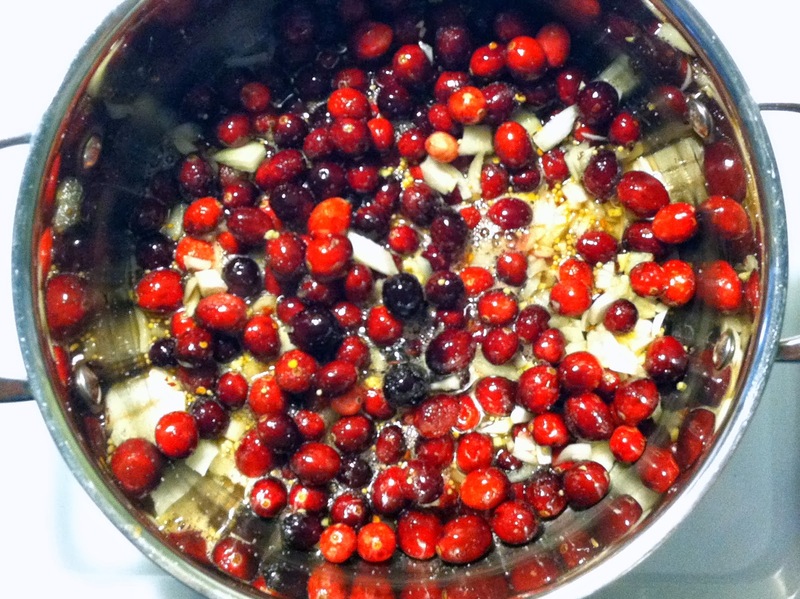 Cranberry sauce from a can is absolutely delicious. But it's also easy to make from scratch and can be varied endlessly. 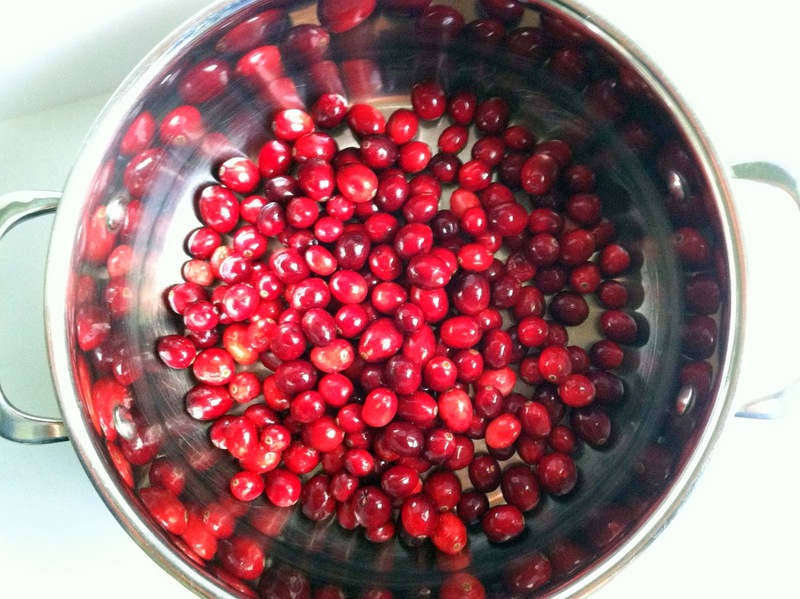 Aunt Lynne made a cranberry chutney this year, more savory than sweet. Of course I wanted the recipe - it called for a reprise during Christmas! I'm hosting a smaller group of family for Christmas this week. I'm so excited that I planned a seven course meal and maybe even a "table scape." Okay, not really a table scape, but I do have a tablecloth and matching napkins. And a table and chairs, if I remember to bring them in from the patio in time to warm to room temperature. 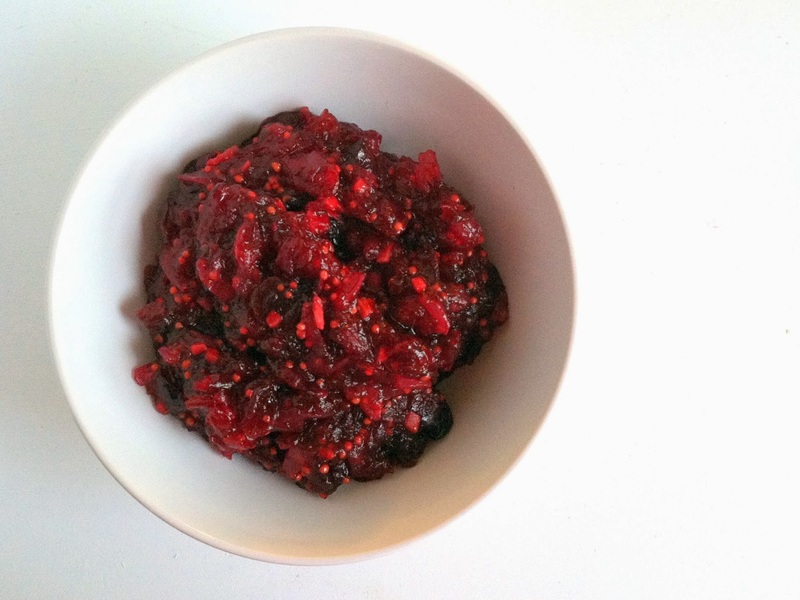 Part of this meal is a cheese plate with olives, crackers, and this festive cranberry chutney. You can make it in about a half hour and hardly need to pay that much attention. If you have been crazy with holiday get-togethers and have been charged with bringing an appetizer to one, I encourage you to steal this idea. No one will be disappointed, except Grinches. In a large saucepan, combine all ingredients. Put on high heat until simmering, then reduce to low. Simmer until thickened and cooked through, stirring occasionally. Allow to cool, transfer to fancy serving bowl, and think of all the possibilities! This will likely wrap up my 2013 garden series, which I'm happy to report was ten posts in total. I finally made it out to the garden to clean it up a couple weeks ago, before the real winter weather rolled in. Under the mass of dried and dead tomato vines and the pole bean hedge, I found that I still had plenty of Swiss chard, sage, parsley, and thyme (no rosemary). 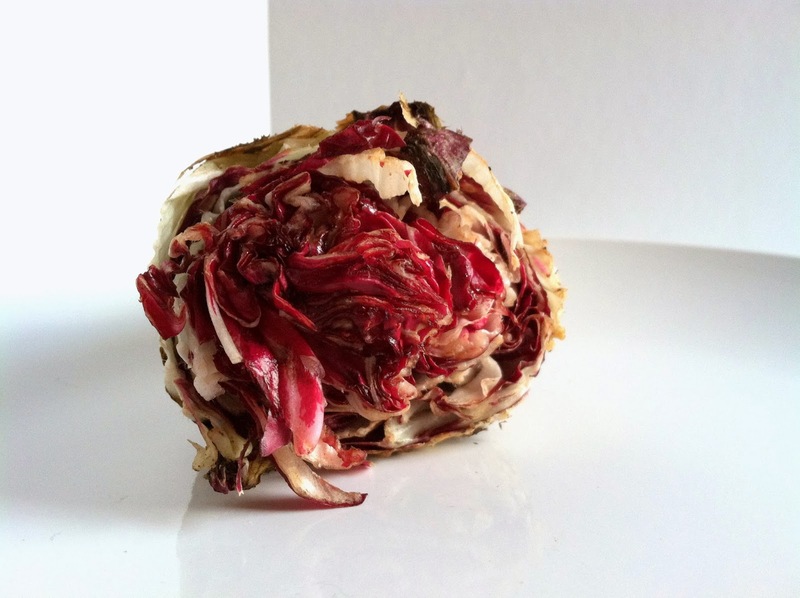 And radicchio! What a beauty! In standard store-bought salad mixes, I am not a huge fan of the thick, bitter leaves. 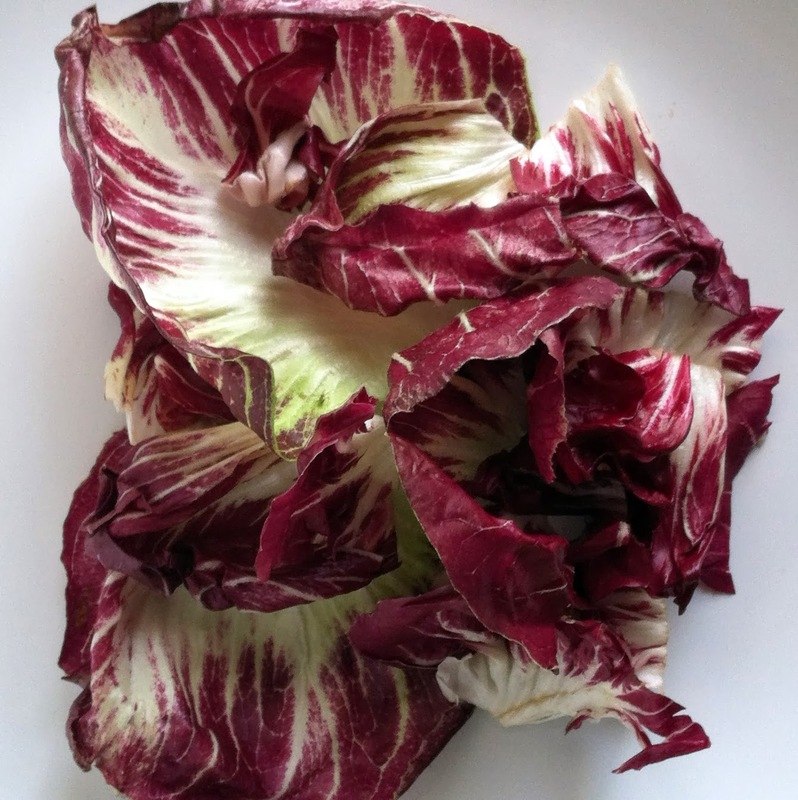 And although Italian eat radicchio regularly (hence its Italian name- and those are hard Cs there), I totally grew this one for its looks and it didn't disappoint. It starts out as a hardy green that forms a head. At one point, I tried sautéing these green leaves with salt and olive oil, but the dish was too bitter to eat - so much so, I started to wonder if the plant is actually poisonous at this stage. Then I left the plants to themselves and they started turning their famous deep purple at the veins and edges. Quite beautiful, really. I decided that once they turned full purple, I would try grilling or braising them... something to get some char on the cut side and to be served with vinaigrette. It worked. 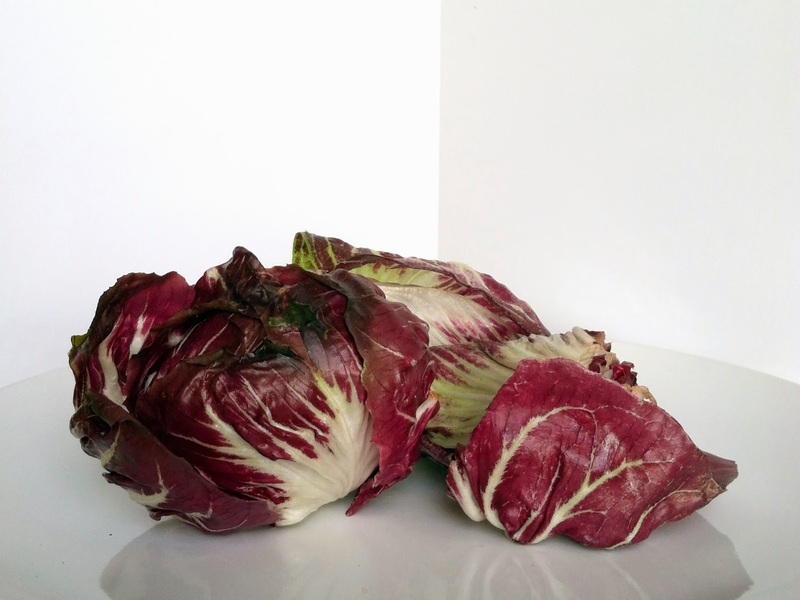 Peel outer leaves off of the radicchio until you reach the clean, tight inner leaves. Trim stem end and slice lengthwise in half. Heat about a tablespoon of olive oil in a skillet (this skillet should have a lid that fits it for later) over medium-high heat. 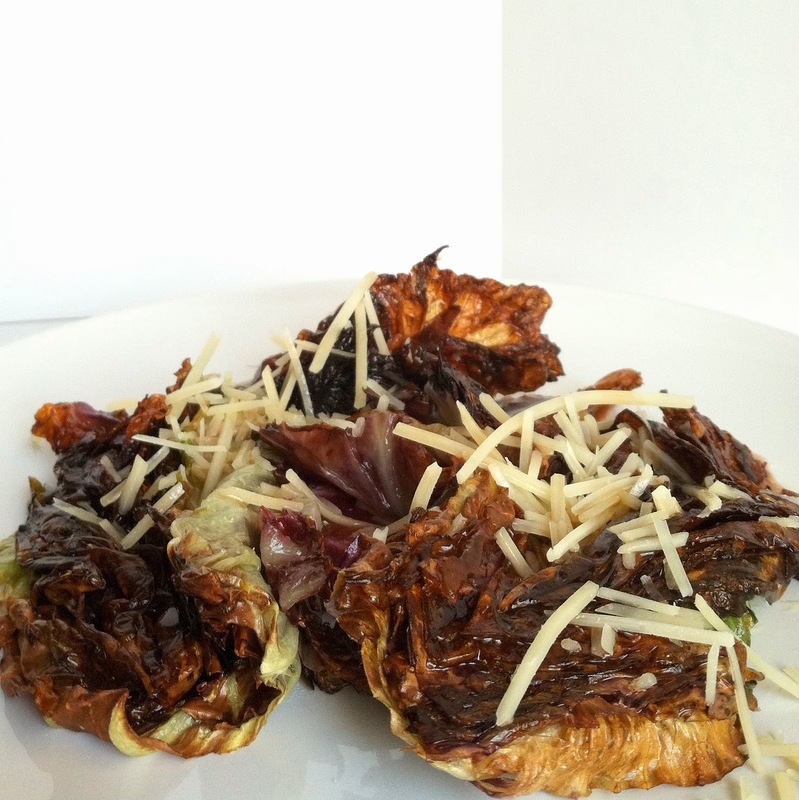 Once hot, place the radicchio in the skillet, cut sides down. Allow to sizzle for a minute, reduce heat to medium-low and cover. Allow to cook for about 2-3 minutes and turn off heat. The radicchio will release a lot of moisture, so to avoid oil splatter, you can leave the skillet covered until sizzling subsides. Meanwhile, put 1/4 cup olive oil and vinegar into a Mason jar or similar container. Add mustard, a pinch of salt, and a few grinds of black pepper. Seal jar and shake well. 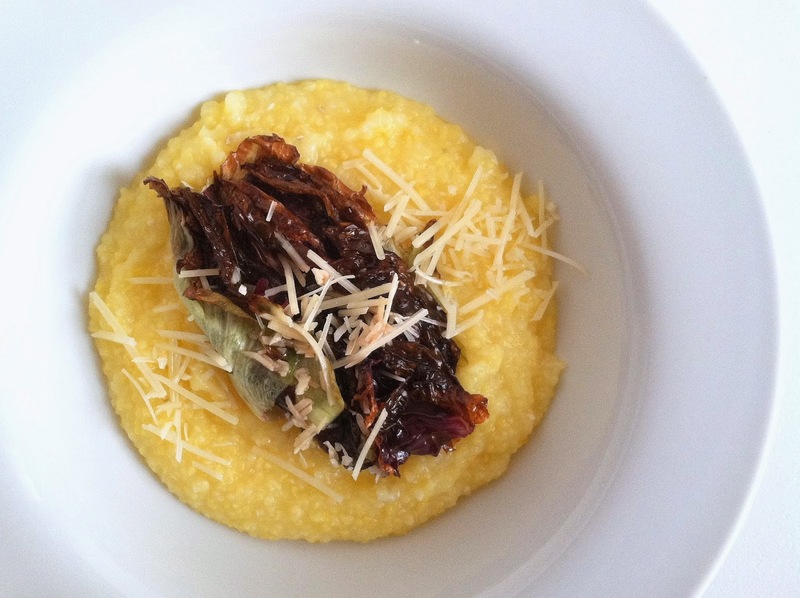 Remove the radicchio from skillet using tongs and place on top of polenta (or by itself on a plate). Season with salt and pepper, drizzle with vinaigrette (you'll have plenty leftover for future salads), and top with parmesan. The radicchio will still be slightly bitter, but should be balanced with the vinaigrette and have some nice, crispy edges from the browning. Enjoy! The past week was full of entertainment! I went to a play reading, started one of those free trial months on Netflix (turns out it still isn't for me), went to see Thor: The Dark World, and watched the Broncos defeat the Chargers. I had popcorn more than once and decided that you all might like to see about growing and making your own popcorn. It's fun! I decided that growing regular corn does not really work in my garden. It takes up too much space to get a reasonable amount and there is about a one-day window to harvest and eat it in the proper stage, if you choose to grow an heirloom variety, which I do. Popcorn varieties, on the other hand, tend to be a little smaller and you just leave them out there until the stalks start to dry out. And say a little prayer that the squirrels don't figure out how to peel back the husks (hint: don't help them by checking the ears of corn). 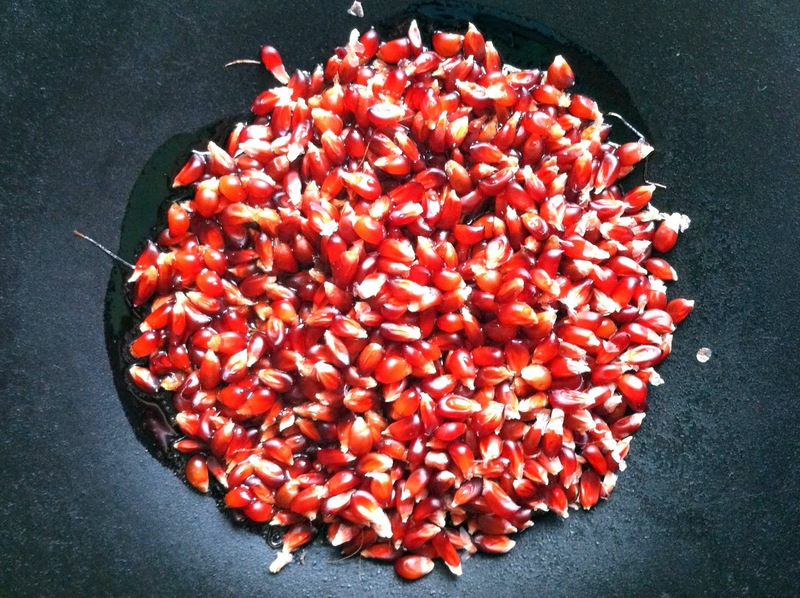 I grow a variety called "Strawberry Popcorn" - named for its brilliant red kernel color. It's an heirloom variety and the seeds save very well. It grows to about four feet and each stalk produces two small ears and the kernels pop up small and bright white. This year, I gave regular eating corn another chance, but had I given over the space I had for corn to just popcorn, I think I would have had a decent stock for winter. 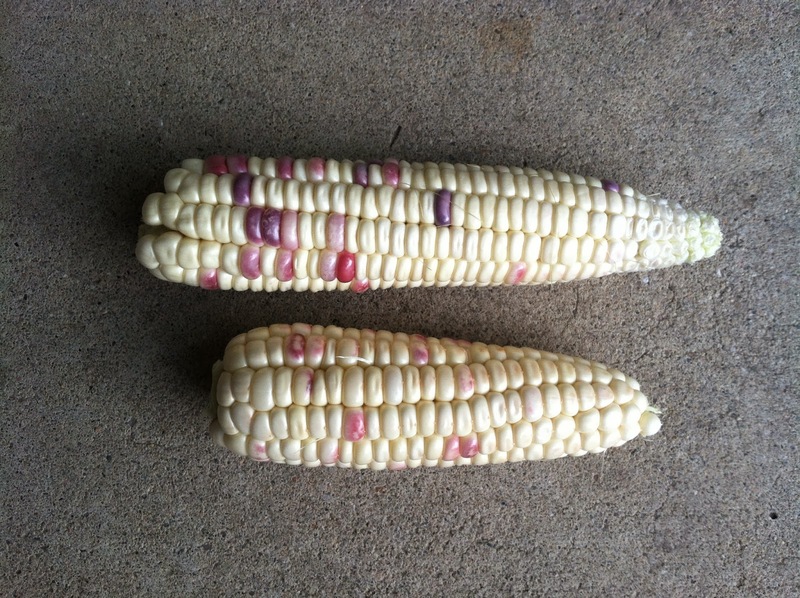 The eating corn I grew is "Rainbow Inca" (shown below) and is quite pretty. 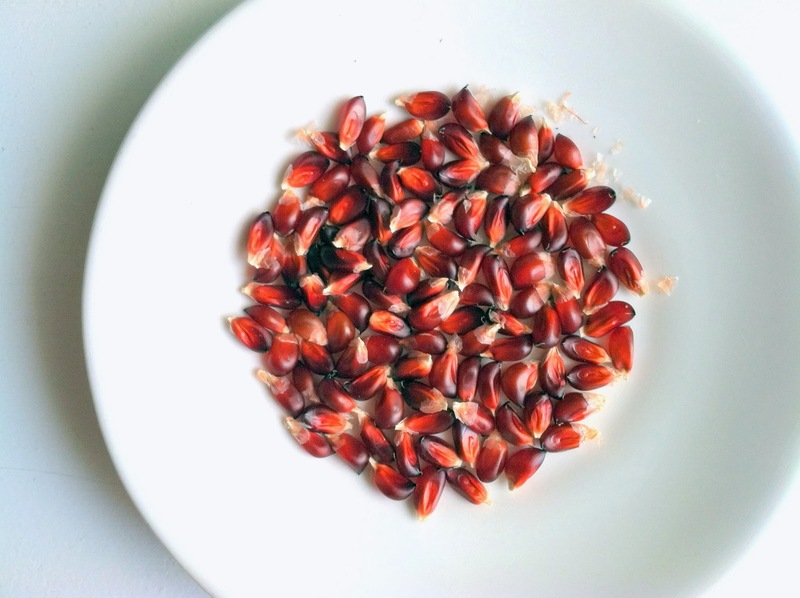 It has an honest corn flavor, but goes to starch about two days before I try it every year ("dent" stage, as can be seen by the dents in the tops of the kernels). Very gummy. Popcorn is such an entertainment food! 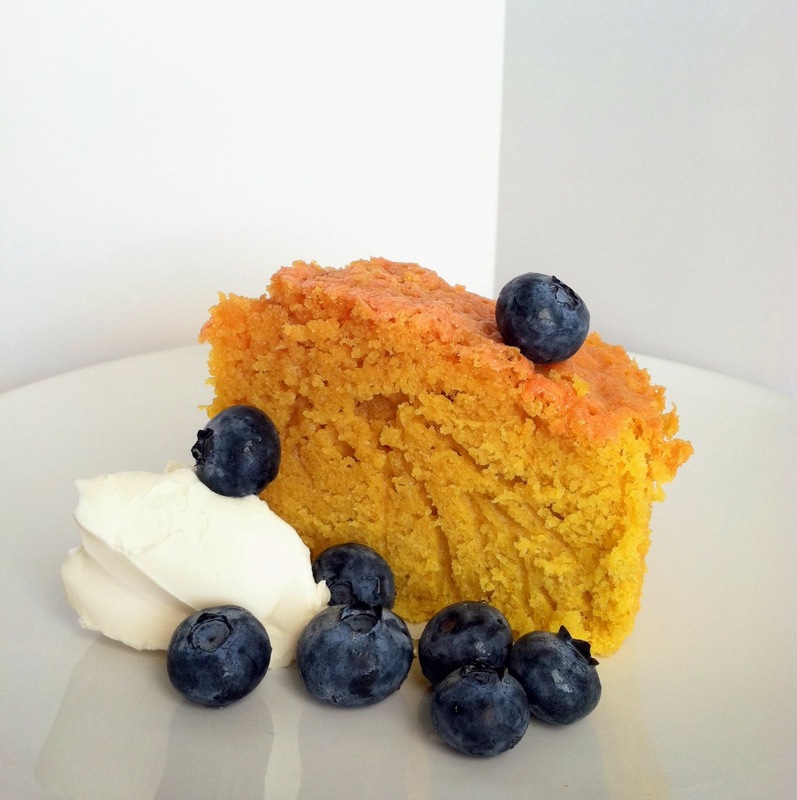 It can serve the needs of a variety of dietary restrictions and almost everyone loves it. Today is not so much a recipe - it's pretty basic, but a reminder to give it a try and dream up possibilities with it. I like the standard buttered and salted popcorn, but also love adding jalapeño powder, chocolate drizzle, or dried fruit. I have a friend who adds a milder chili powder and truffle oil to great results. Pets also like popcorn, which to their delight inevitably gets dropped on the floor during snacking. 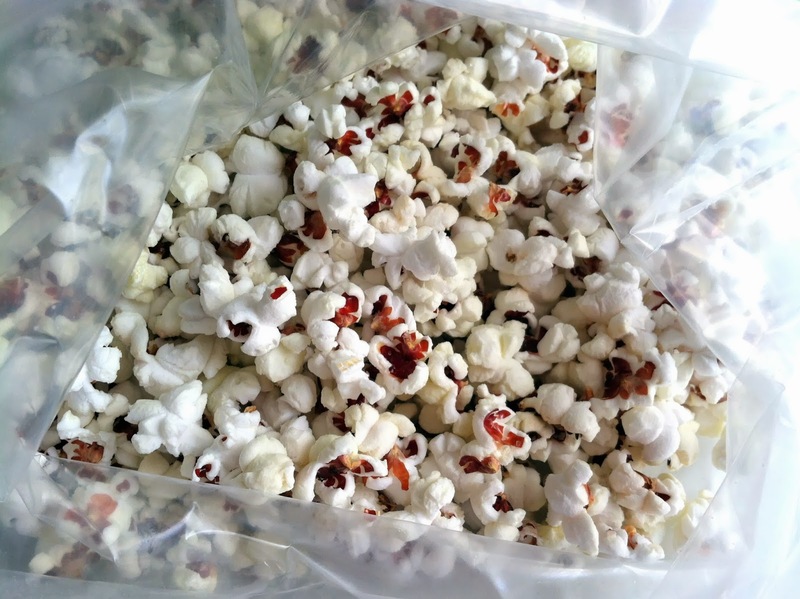 Place oil and kernels in a popcorn maker (I have a super-seventies one with a butter drip container built into the lid), plug in, and allow to pop. Unplug the maker when the popping subsides. 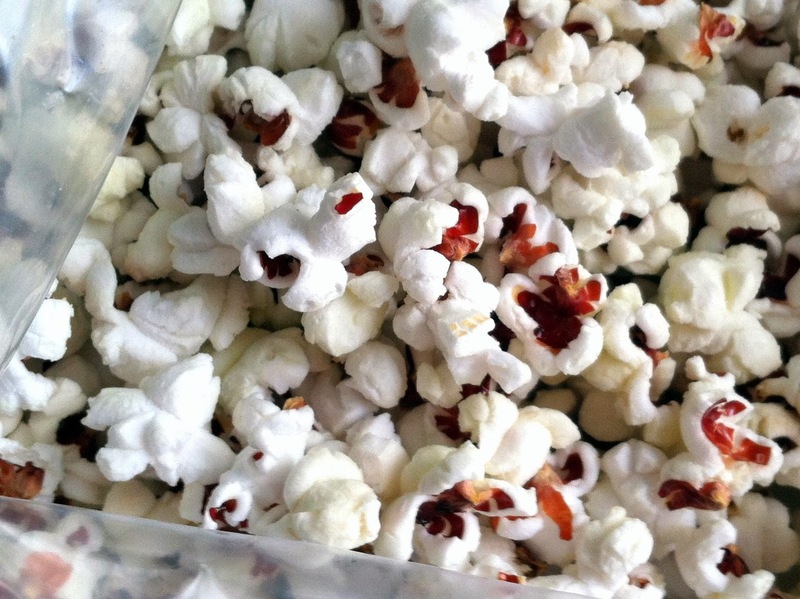 I have never actually made popcorn on the stovetop, but I found great instructions here. Any special additions that you like? Please, please, please, put them in the comments - I love collecting new ideas! Now go make popcorn and be entertained!